It was back in 1912 that brothers William and Gilbert Greenslade, who had previously joined their father's cycle repairing and manufacturing business, purchased a Model T Taxi for £97. They quickly expanded the business by purchasing two more Model T's and introduced a service between Hele Station and Bradninch. 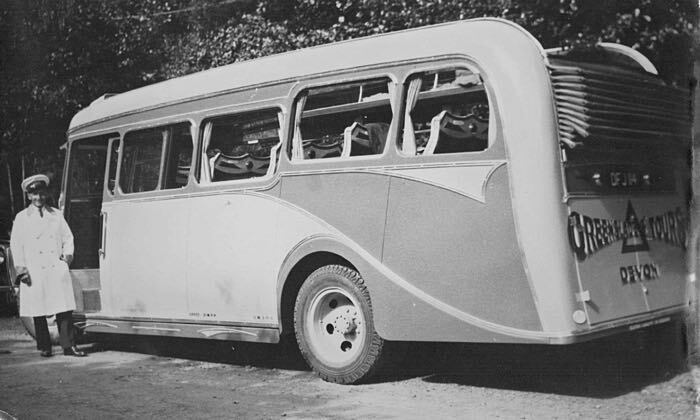 They further expanded with a couple of French built, 14/20 seater, charabancs and commenced a coach service from their base in Fore Street, Bradninch, near Cullompton. The vehicles were driven by the brothers, touring on day trips from Exeter through Devon. These were the days when their customers arrived by train from London and the north of the country. The business flourished and the charabancs had to be serviced at night as they were constantly working during the day. Their sister, Mrs Evelyn Dyer ran the business during the First War, while the brothers served in the Royal Flying Corps. Bill Greenslade continued his interest in the RAF after the First War, and in the late 1940s was the commanding officer of the local ATC. The boys in the corp were often ferried to Exeter Airport in a Greenslades coach for glider training. After demobilisation in 1919, the brothers purchased a second-hand Maas touring car that was re-bodied as a 14 seater. In the same year, Bradninch proved to be inadequate for their expanding business, and they purchased the old Collins Horse Repository, a house with stables, at 85a Paris Street (where the Civic Centre now stands). They were joined by their younger brother, Percy Greenslade, who ran the maintenance shop.They expanded the taxi business, along with a carrier service between Exeter and Tiverton, using a Dennis lorry. They further expanded, by purchasing a 75% interest in the Crediton company of Milton Services, which continued to run its own, two tone blue liveried coaches. The Teignmouth company of Belcher Ltd was acquired in January 1932, as Greenslades continued to expand. 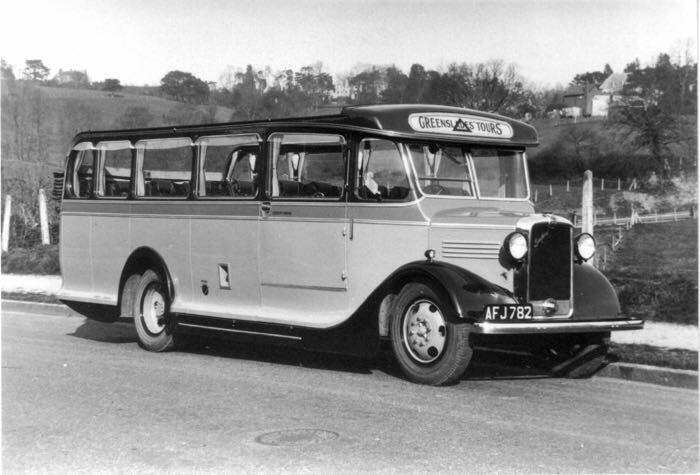 In addition to running day trips and touring, Greenslades purchased, in 1932, The Witheridge Transport Co Ltd which provided a bus service from the Witheridge area, west of Tiverton. The Witheridge fleet continued to run in its red livery. In May 1933, Greenslades formerly became Greenslades Tours Limited. During the 1930s Greenslades also purchased the fleet of Broadbeer and Sons, trading as Regent Coaches of Teignmouth, Arcadia Coaches and three vehicles belonging to Gunn's Tours of Rackenford, Tiverton. In 1939, they took over Abbott's Blue Bus Service of Exmouth, with Abbotts local bus services transferred to Devon General. 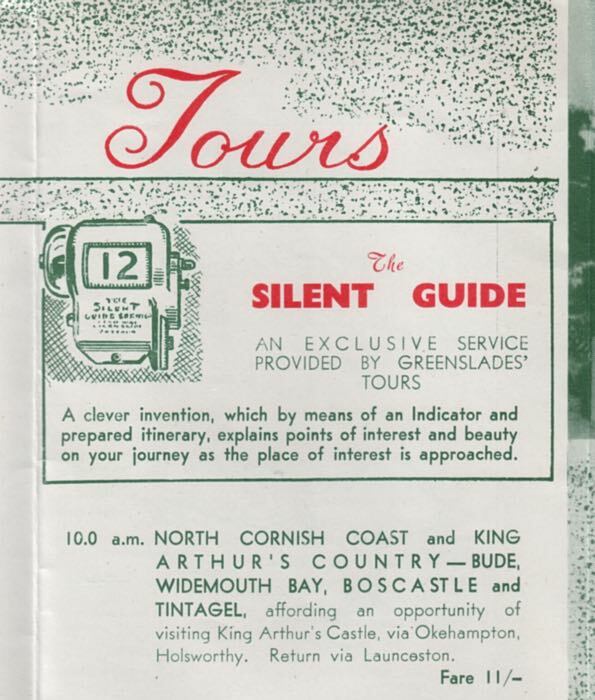 A feature that Greenslades offered, from the 1920's to after the Second War, was the so called 'Silent Guide' on their coaches. Each passenger who booked one of their day trips would be given a leaflet, with numbered paragraphs, describing the features and country side through which the coach was passing. When the coach passed a particular beauty spot or interesting building, the driver would display the number for that place on the front, interior bulkhead, and the passenger could read the notes for the place. During the war, Greenslades took on contracts with the War Department, while their PSV business became more or less dormant. In 1943, their head office was moved to 14, Queen Street. 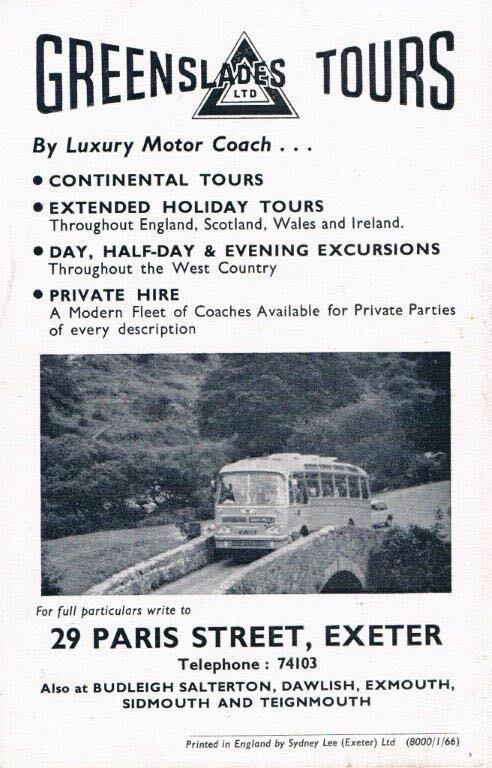 The era after the war saw the company sell their bus business to Devon General, and from 1948, concentrate on longer trips by obtaining a license for extended tours. Holiday tours across the country and in to Europe were organised, providing the first taste of foreign travel to many. In 1953, the business was purchased by British Electric Traction (B.E.T.) The main depot was in Exeter, but the expansion under B.E.T. required bases in Budleigh Salterton, Dawlish, Exmouth, Sidmouth and Teignmouth, as the country started to take longer holidays in the Devon seaside resorts, and the European tours were extended. The brothers were well respected in Exeter, and Gilbert became the Sheriff of Exeter in 1950, and Mayor of the City in 1953. William was awarded the MBE in 1950, and left the business in 1963, to start up a new touring company of his own. In 1969 B.E.T. sold out to the state owned National Bus Company and hence became part of Western National. The Thatcher Government saw big changes to Britain's bus and coach operators with the advent of privatisation. First, in 1983, Greenslades passed to a newly formed Devon General, then in 1986 Devon General was itself, subject of a management buyout. 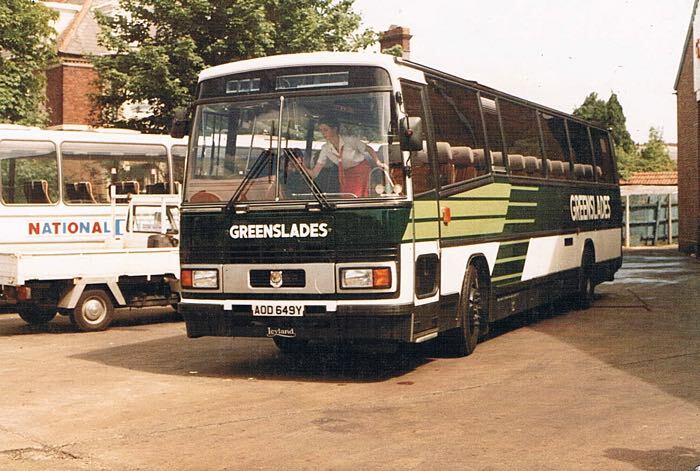 Greenslades was purchased in 1987 by Nightingale Coaches of Exmouth. 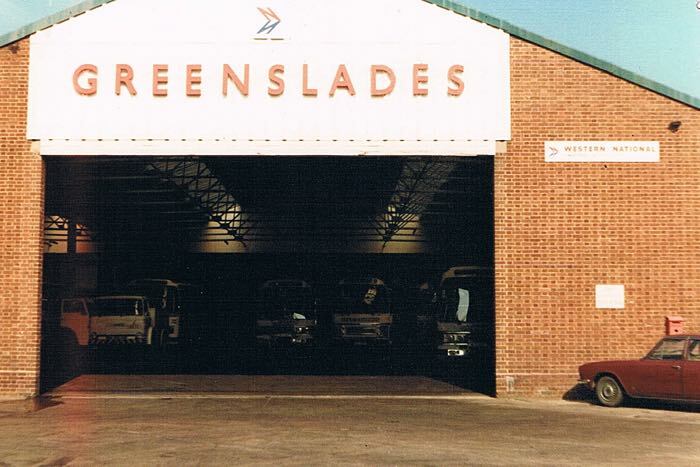 The recession of the late 1980s was difficult for Greenslades, but in 1990, Hookways of Meeth, took over to form Hookways Greenslades and give the combined Exeter company a new lease of life. The company's fleet was still maintained at Pinhoe, Exeter, with large overhauls carried out at Hookways depots in Meeth and Bude. However, the company ceased trading in 2011. Sources - Greenslades history on their website. City Council guide books. A history of Exeter public transport. Fleet History of Greenslades Tours Ltd, published by The PSV Circle. 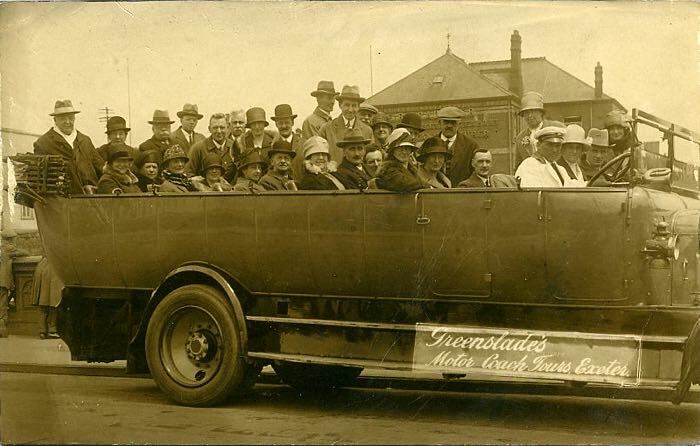 A Greenslades charabanc from the 1920s. A Greenslades coach from about 1930. The driver is Bob 'Taffy' Watkins. Notice the folded roof. Photo from Gwynneth Crawford, daughter. A Greenslades coach from about 1937. The two tone green livery. Entrance to the Greenslade Garage. An advert for Greenslades Tours – 1950s. 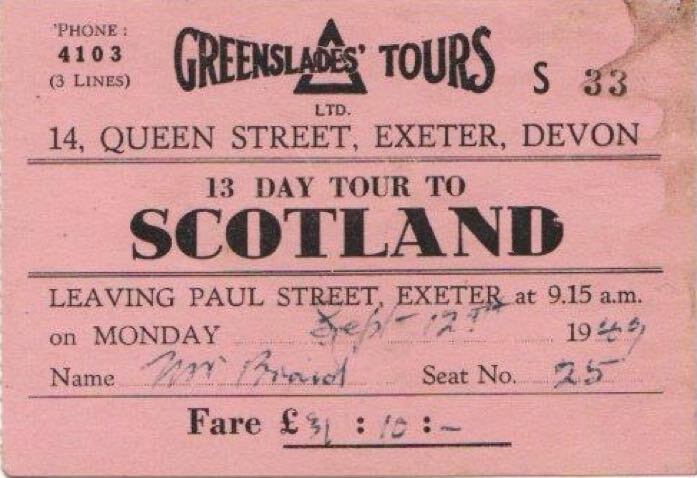 A ticket for a Greenslades tour of Scotland in 1949. It appears to have cost £31 14s. 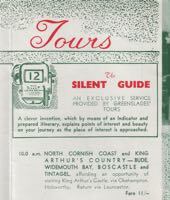 A leaflet outlining the benefits of the Silent Guide system from the 1950's.